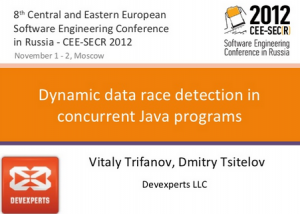 Dmitriy Tsytelov, Devexperts Senior developer, and Vitaliy Trifanov, Devexperts Lead developer, has got the Bertrand Meyer prize for their report “Dynamic data race detection in concurrent Java programs” on CEE-SECR in Moscow on November 1, 2012. To see the report’s presentation download it here. Data races are among the most frequent errors in concurrent programs. Data race happens when several threads access the same shared memory location and at least one of the threads writes to it. Usually data races are very dangerous because they unpredictably change program flow and corrupt shared data structures. It is very difficult to detect data races manually, because often their effects cannot be seen immediately (as apposed to deadlocks) and depend on uncontrollable interleaving of threads’ execution. In this report we will present our dynamic data race detection tool. It gathers and analyzes information about program execution and detects data races on the fly. Tuning performance and memory consumption overhead.